Business Insider was first to report the development. The Nest Guard is one component in the Nest Secure range of home security products. The system includes various sensors that can be monitored remotely by the user. Nest Guard is an all-in-one alarm, keypad, and motion sensor but, despite being announced well over a year ago, the word “microphone” was only added to the product’s specification this month. The change coincided with the announcement that it was now compatible with Google Assistant. It added: “The microphone has never been on and is only activated when users specifically enable the option. The firm's mea culpa has been accepted as genuine by many company watchers, but some say it still raises significant privacy concerns. "This is the kind of thing that makes me paranoid of smart home devices," commented Nick Heer, who writes the Pixel Envy blog. "If I owned one of these things and found out that the world's biggest advertising company hid a microphone in my home for a year, I'd be livid." UK-based privacy campaign group Big Brother Watch added: "Many of our worries about smart home devices appear to be proving true... Google should be held to account for wrongly advertising this product." 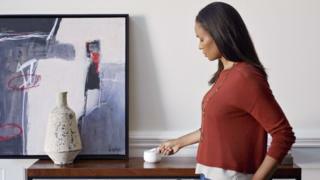 Nest Guard went on sale in the US last year as part of Google's Secure alarm system. A European and Canadian release is also planned but has yet to occur. Nest, a company known for its smart thermostat, was acquired by Google in February 2014, for a reported $3.2bn (£2.5bn). The acknowledgment comes days after Singapore Airlines faced criticism for installing cameras into the backs of some of its planes' seats as part of a new in-flight entertainment system. The company confirmed the cameras' existence on Sunday, but said they had been disabled and added that it had no plans to use them.